KelTec is renowned for interesting designs in modern plastic and metal. The PMR30 continues this. I'd been eager to get hold of one for months, and was quite happy when I did. I only had it for a couple of hours, so my testing was limited. 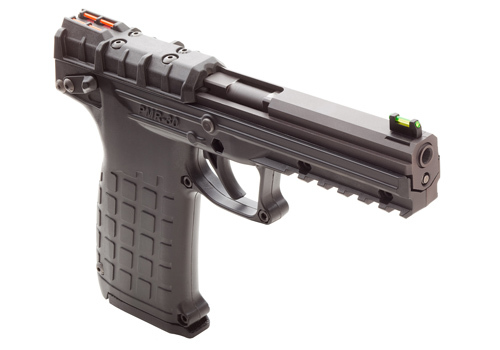 The PMR30 is a .22 Magnum pistol with a 30 round magazine. It has a hybrid blowback/locked breech system that enables it to shoot several different loadings and weights of ammo, depending on chamber pressure. It has an ambidextrous safety, an easy to reach heel magazine release, a forward rail for lights or other accessories, and can accept a top rail or other mounts. Barrel is 4140 steel, frame 7075 aluminum, and all the supporting material is Zytel. It looks very thin and light in construction with its fluted barrel, but is quite sturdy and mechanically sound. Function was very consistent. It has enough suppressing fire to last several minutes, and sufficient power for small game, or combat stops with multiple hits. With 30 rounds, there's enough ammo for either. Empty, the pistol weighs about 13 ounces and feels like a toy. I thought it was 5 ounces, honestly. There was nothing to it. I found the grip comfortable, the controls easy to reach, and it pointed very well. Loaded up, it was grip heavy enough for good balance, but still very light. The trigger had a little slack, but was very consistent. I wasn't able to measure the pull, but it was easily manageable (KelTec claims 4-6 pounds, and it felt right in the middle). The fiberoptic sights were bright and very friendly, aligned easily with the grip angle. I didn't do any rest shooting, but off hand was all within silhouette at 15 yards, unfamiliar with the weapon and without doing any real aiming. I just pointed and shot. I had one stovepipe with rounds tumbled in the magazine during extreme rapid fire. I may have slack-wristed it and recoil jumbled them faster than the follower spring could move. It cleared easily, there were no other problems, and Oleg Volk and others had no issues at all. I enjoyed the really high capacity magazine a lot. It just doesn't seem to run out of ammo, and magazines change very fast once it does. It came with two mags, and two more spares would give 120 rounds of suppressing fire, which is plenty for evading trouble and reaching a heavier gun, or could serve as a defensive arm with multiple hits, or is potent enough for small game if stranded in a remote location. It easily fits in a console, under a seat, in a holster, or anywhere else you'd need a backup weapon. Given the very reasonable price, it wouldn't be a bad idea to have one in each bailout bag for commonality of parts and ammo. The only other downside would be that .22 Magnum is less available than some other rounds, but, it's light enough to stockpile a few boxes ahead of time.